Hydro Seeding Service at the Cascio Company! 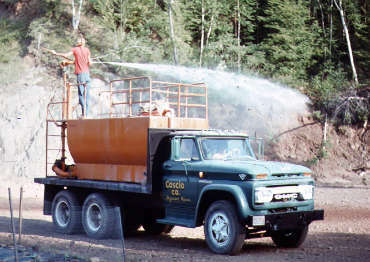 Hydroseeding is a planting process in which a mixture of seed and mulch are applied to a large area. 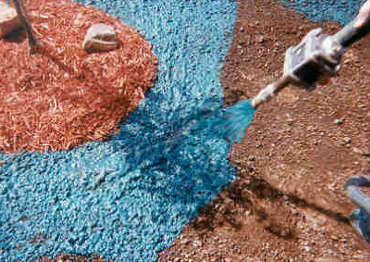 Hydroseeding is an alternative to the traditional process of broadcasting or sowing dry seed that promotes quick germination and inhibits soil erosion.The mulch used in the hydroseed mixture helps to maintain the moisture level of the seed and seedlings. The mixture often contains other ingredients like fertilizer, lime or tackifying agents. Hydroseeding is used to seed grass on commercial sites, golf courses, lawns and areas too large, inaccessible or unsuitable for conventional methods. Starting a lawn by hydroseeding is considerably cheaper than laying sod/turf and quicker than using seed. For more information on Hydro-seeding or for a free estimate, contact us!